Let’s have a look at the layers in this pyramid from the bottom up. The foundation is built from the concrete techniques that are necessary to get the job done. This starts by simply knowing the syntax and semantics of the programming languages used and continues with specific techniques for analysis, design, implementation. Test Driven Development has it's place in this realm as well as continuous integration, automatic builds and build-servers (not the same as continuous integration by any stretch of the imagination), pair-programming etc. Once you know how to wield a hammer and how to handle a screwdriver – and know the difference between the two –, you still need a bigger plan to build things of real complexity. That is where process comes into play. The same applies in the world of software development. Processes lay out how different steps of work are connected to each other, who’s talking to whom and about what etc. But then again process alone is just the beginning - a means to an end. As one manufacturer of tires once claimed "power is nothing without control." While processes give a good indication on how to proceed from gathering requirements through to delivering tangible capabilities to end-users they usually say little on how to control the process itself. How to identify weak points, how to coordinate the work between different stations in the process and so on. This is where process control and process improvement come into play. 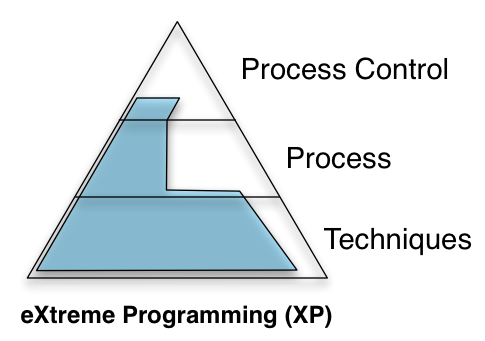 From what I see today in the agile space most techniques which are considered to be part of "common sense" or simple "agile techniques" actually stem from the original description of eXtreme Programming (XP). Test Driven Development, Continuous Integration, Pair Programming, Standup Meetings, On-Site Customers, Sustainable Pace, Simple Design, YAGNI, Planning Game etc. all where first made public via the XP-Website and even more so through the book eXtreme Programming explained (first edition!). Consequently when I put eXtreme Programming in the pyramid it covers quite a lot of ground. It's the only lean and agile approach that I am aware of, that covers so many topics on the techniques level. And it still does a very decent job on the process level. It even has some very clear points on process control. At the time of this writing Scrum has a subjective market share of 92.6% and it appears that almost everybody who is not really part of the ‘inner circles’ of the lean and agile community assumes that Scrum and Agile are ‘almost synonyms.’ Of course nowadays many people claim that Scrum requires unit-testing, continuous integration, user stories and so forth. But if you look it up in the Scrum Guide you'll find nothing like that mentioned - after all it’s only 16 pages anyway. 16 important pages without question, but they don’t tell you how to implement Scrum. 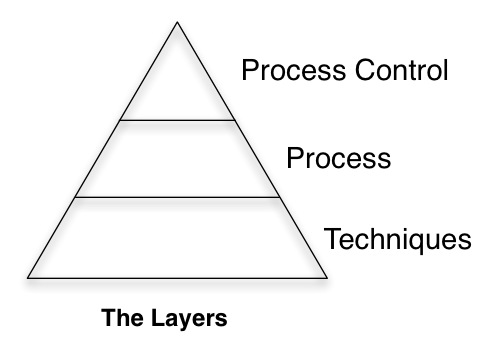 When I try to put Scrum in the Pyramid I end up with a very well defined approach to the topic „process“ – with some very small extensions into process control and techniques. The Kanban Method for knowledge workers is an approach defined by David Anderson based on the way Toyota optimizes their processes. While some people see Kanban as a different approach to software development – saying things like “we switched from Scrum to Kanban”. 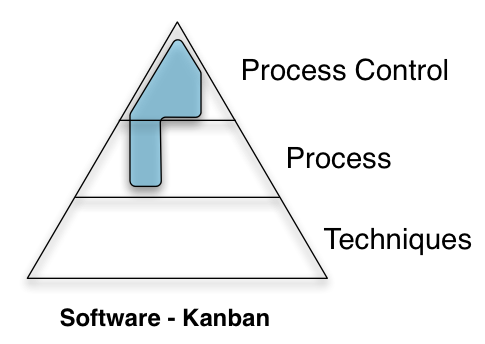 David Anderson himself points out that this is not the case, since The Kanban Method is “just” a way to run the process – what ever your process may be. 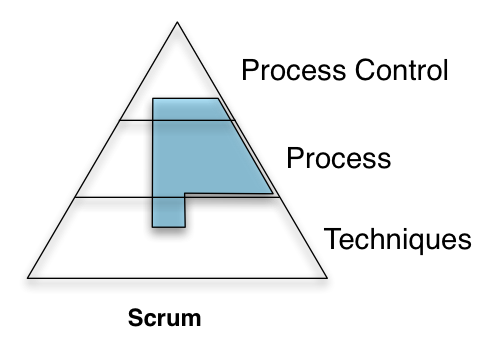 You can (and should IMHO) even run Scrum using Kanban for process-control. 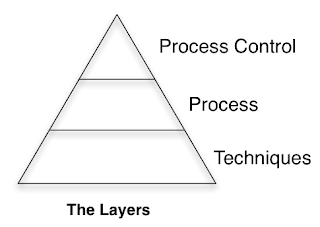 When placing The Kanban Method into the pyramid it fits nicely into the upper triangle, called “Process Control”, and has just a small, well defined extension into the “Process” layer. A short while ago Uncle Bob wrote a very nice blogpost on ‘The True Corruption of Agile’ and argued in a similar direction - the practices form the culture and the culture is identified by the practices present. So, following this pyramid and Uncle Bob’s point of view, I think it is a good idea to make sure to have the foundation (the practices) intact and use all the concepts on the appropriate level of abstraction. Where do you try to make changes happen? P.S. : I introduced the German version of this pyramid as part of a (German) [podcast episode back in 2012][za-episode], as part of Maik Pfingsten’s Zukunftsarchitekten Podcast. "The Sky's the Limit" ?